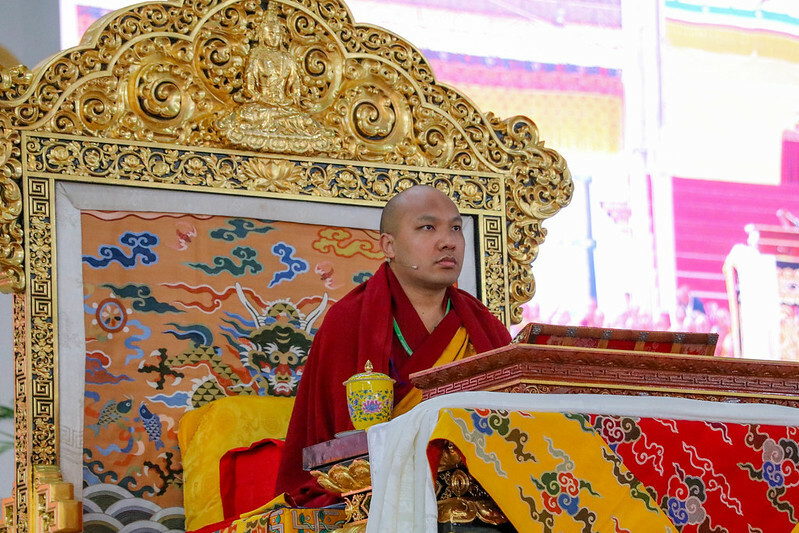 This year sees the conclusion of a five-part teaching begun by the Karmapa on 31st December 2012, the year in which the Kagyu Monlam commemorated the Jamgon Kongtrul lineage, and hence the choice of this text by the First Jamgön Kongtrul Lodrö Thaye. The text is a guide to the ngondro or preliminaries to the practice of Mahamudra in the Kagyu tradition. First, come the common preliminary meditations—known as the four thoughts which turn the mind to Dharma, they are the precious human life; death and impermanence; karma, cause and effect; and the unsatisfactoriness of life in samsara. Then come the special preliminary practices. At successive Monlams, His Holiness has completed giving instructions on the first three: Refuge and Prostration; Vajrasattva Practice; and Offering the Mandala. This year he will be teaching the final special preliminary practice which is Guru Yoga and giving pith instructions on Karmapa Mikyö Dorje’s Four-Session Guru Yoga. The Karmapa emphasised once more that those within the Karma Kamtsang who had just received the Chakrasamvara empowerment had committed to a daily recitation of then Four Session Guru Yoga for the rest of their lives. However, those from other traditions or not within the Karma Kamtsang were free to practice the most important guru yoga from their individual tradition instead. The main point is that merely taking the empowerment is not enough. Taking the empowerment makes you capable or suitable for practising the path of secret mantra and so once you have taken the empowerment if you continue the practice it will be beneficial. Otherwise, if you have received the empowerment and you think that’s an end to it, there’s nothing more to be done, and just sit back and relax, that will not be good. You absolutely need to continue the practice. For those who already had many yidam practice commitments, it was possible to transform the Guru Yoga into an all-encompassing practice by imagining that the Guru is the union of all the yidams and protectors. Having read the first section of the text, His Holiness clarified why, when we practice guru yoga, we do not practice in our ordinary form but imagine ourselves and meditate on ourselves as a yidam deity. “We need to forcefully block ordinary impure appearances. If we block them and develop pure appearances, we will be able to easily receive the blessings,” he explained. This gives us confidence and also alters our perceptions. This then is the buddha nature. In the Prasangika tradition this is basically described as the object or emptiness, but in the Tathagatagarbha tradition, or the tradition of the Shentong school, which is also the Mahamudra tradition, we say that buddha nature is not merely the object emptiness, not merely a no-negation, it is not merely an absence. Instead, we say that it is the luminous wisdom, the conscious subject; it has the nature of luminosity. So in the Middle Way School, they say that this intrinsic nature of things, the dharmatā [Tib.chö nyi] is the fact that all phenomena are empty of their own nature, but they do not actually point out what that dharmatā is. In the Tathagatagarbha tradition, the Shentong tradition, they maintain this is what the dharmatā is, what the nature of all phenomena is—this conscious subject of wisdom. So, when we meditate on a yidam deity such as Avalokiteshvara, it is not the same as pretending because we all share the same wisdom [Tib.yeshe] as the yidam deity. “In terms of the aspect of natural purity or in terms of their essence there is not the slightest difference. In terms of its form, there is the distinction whether it is obscured by the adventitious stains or not. But in terms of its nature, it is actually stainless and unobscured,” the Karmapa stated, comparing this to gold. Gold has to be extracted from ore and smelted, but there is no difference in the essential nature of the gold when it is in the ore and the gold once it has been smelted and purified. His Holiness then considered the question on which deity we should meditate, and explained that in the Karma Kamtsang the tradition is to visualise ourselves as Vajrayogini (Tib.Dorjenaljorma) in the form of Vajravarahi (Tib.Dorjephagmo) for several reasons. First, she was the yidam deity of the Kagyu forefathers, Marpa, Milarepa and Gampopa. Second, she represents the co-emergent Mahamudra. Finally, Gampopa gave Dusum Khyenpa, the first Karmapa, the practice of Vajravarahi as his creation phase practice. “If you are able to visualise yourself as Vajravarahi, that’s good. If you cannot do that, visualise yourself as another yidam deity,“ he concluded. The morning’s teaching session ended at this point. During the tea-break the assembly recited the Twenty-One Praises of Tara, and then in the second part of the morning session, everyone had the opportunity to practice reciting the Four-Session Guru Yoga, led carefully and slowly by the chant masters.